Can the new Bold better the excellent original? RIM has updated its flagship model with a sleeker and more powerful model – the Bold 2 9700. Featuring an improved processor and latest UI, the phone certainly has the specs but can it stop the iPhone and Android onslaught? The BlackBerry Bold was one of the standout devices of last year – it was RIM's statement that it was coming for the consumer market. And while it was successful, there always comes a time for a refresh, and that's where the new BlackBerry Bold 2 9700 comes in. It's a sleeker, faster and more able device than its predecessor, and it shows. We're talking 16g lighter, 6mm less wide, 5mm less tall and a whopping 0.9mm thinner. But what this means is a more cramped keyboard, which will be a big worry for some who picked up the Bold, not because it was one of the first BlackBerrys to use 3G, but because it had one of the largest keyboards in the range. The device's diet does add a touch of class to proceedings – it now looks like a Storm 2 handset but with a whole lot of keys jammed on instead. The top of the phone houses two buttons: the lock and the mute keys. The former will turn off the screen and lock the keys, and the latter will mute the phone when ringing, but holding it down will put the phone into standby mode. The screen is now among the most high-res in the BlackBerry world, as it stands at a Magic-matching HVGA resolution. It's also supposed to have a light-sensing display, but the Bold 2 9700 seemed confused about that function, constantly upping the brightness of the screen when light conditions don't seem to change. The right-hand side of the phone holds the rubberised keys, which function as the up/down volume buttons and also as music navigation buttons for the media player. A similar rubberised option is further down the side, which functions as the camera shutter key. On the left-hand side lives the function key, which can be programmed to perform a number of functions, with the default being voice command of the phone. Above this lives the exposed microUSB port, as well as the recessed 3.5mm headphone port. This is built into the curved chassis, which means a portion of the headphone jack is left exposed. On the older Bold this was a flush socket, which meant a more snug fit – however, we didn't experience any problems with the audio playback, so it's just an aesthetic issue. The keyboard itself is a little cramped for our tastes, with the 6mm loss in width a bit too much to make the keyboard as easy to use as before. However, RIM has taken this on board and made some decent changes by increasing the prismic feel of the keys to give your fingers more to hit, which will go some way to making typing more accurate (especially if you have longer fingernails... so we're told). The layout of the keyboard is the same as before, with the menu button and return key flanked by the call and terminate keys. 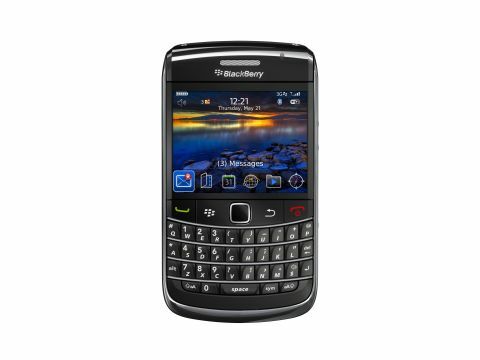 As we mentioned before, there's no trackball in sight here, being replaced by the optical trackpad first seen on the BlackBerry Curve 8520. This gives a different (and darker) look to the front of the device, and early indications seem to suggest that early users appear to like the new hardware. The back of the phone brings that beautiful (or not) faux leather feel, although this time it's not the whole way across - just a wide strip of the battery cover. The camera is improved too, with a 3.2MP snapper combined with an LED flash making things a lot more consumer friendly. The chrome outline of the first Bold is back again, but this time it's more refined and part of the chassis, which we think gives the Bold 2 9700 a classy finish compared to the original effort, which had the same thing the whole way around the outside of the unit. While smaller, the BlackBerry Bold 2 9700 has a nice refined feel to it, and while the keyboard is a little bit on the cramped side, it certainly makes the unit look sleeker. However, we're worrying that the new design might actually alienate previous bold users, who found the larger keyboard to be a real boon when it came to typing out messages. The wider shape might have annoyed some people, but given that a fair amount of the hardware is the same we're wondering whether most might prefer the old version.